Paul Backett, Industrial Design Director, Ziba Design, Inc.
Christian Freissler, Senior Industrial Designer, Ziba Design, Inc.
As culmination of the Fall 2010 term, students in the University of Oregon’s A&AA | Portland Product Design program gathered on the evening of December 2, 2010 for an exhibit of their work. 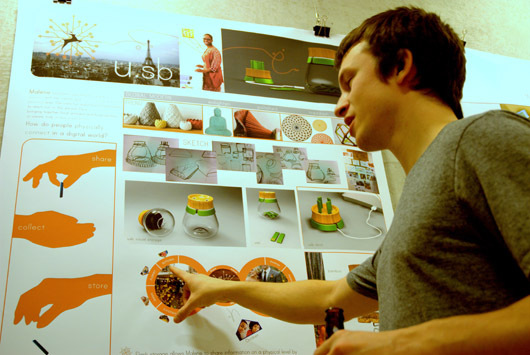 Product Design Program | Portland, Final Review Session, Fall 2010. 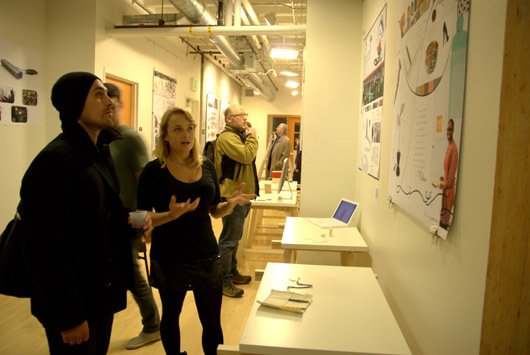 Following a December 1, 2010 final review, the students’ publicly released their concepts and designs by displaying both story boards and crafted examples of their work in the White Stag building’s School of Architecture and Allied Arts 4th Floor lobby. The exhibit will remain in place through the month of January 2011. Some students’ work has been moved to the main front entrance lobby of the White Stag building for greater public accessibility and viewing. 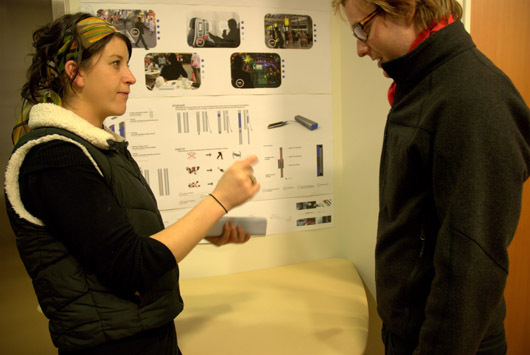 Ruby Sprengle discusses her project with a Ziba designer. With a goal of designing a home/business office product, the co-professors, Freissler and Paul Backett, also with Ziba Design, Inc., led the students to first define a clear consumer target. 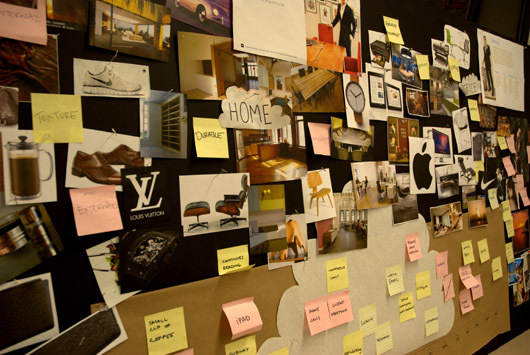 They divided the students into four groups and encouraged them to bring “four very different personas to life”, and create an office product that would be used and appropriate for this individual. The vital task of understanding the target consumer and comprehending and interpreting their functional and emotional needs as well as discovering an opportunity of space in this individual’s life helped define the project. Student research lead to storyboards that illustrated information on personalities and lifestyles. Freissler noted that “in the concepting phase the students went into a broad and rapid exploration of visual and functional concepts.” And that “sketches and quick models were the main tools.” He continued that the “main idea was to create as many relevant directions as possible and present them to an audience of designers and University of Oregon teachers” at mid-phase in the term. Post mid-term, each student chose a final direction for refinement and took their project to more highly developed and realistic levels. 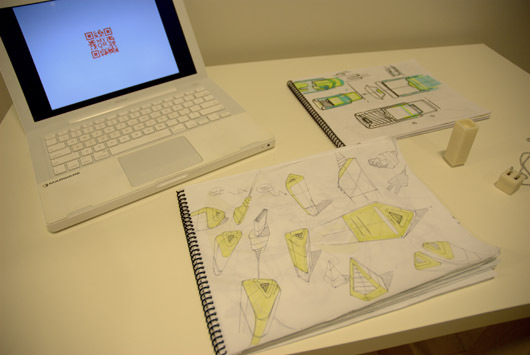 All students spent the following weeks focused on detailed design exploration in sketching, 3D CAD and modelmaking and uncovering what defined “an office” for the personalities they were designing for. 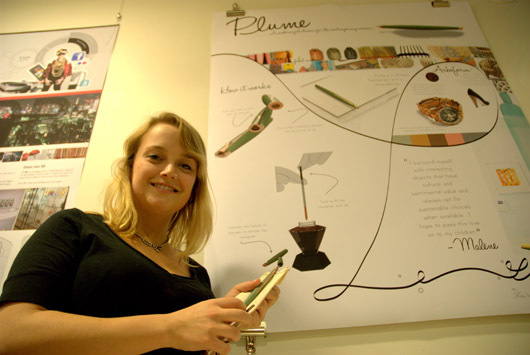 Student Andrew Lindley commented, “the characters that we had to design for really pushed the boundaries of what defines an office product as we strove to match lifestyles, career choices, entertainment preferences and the like.” The overriding intent was to create products that “connected with consumers on both functional and emotional levels, and [consequently] the students worked very hard to refine details, colors, finishes, and the materials of their concepts,” according to Freissler and Beckett. Products expressed a desire to tell a story or say something about the user, whether it be about one’s interest in sustainability, one’s devotion to the symbolic nature of specific materials as evoking wealth, luxury or function, or one’s personal lifestyle such as the life of a savvy, travelling, cosmopolitan-based teenager or a Parisienne single mother with highly developed aesthetic tastes or a world-travelling music entrepreneur. 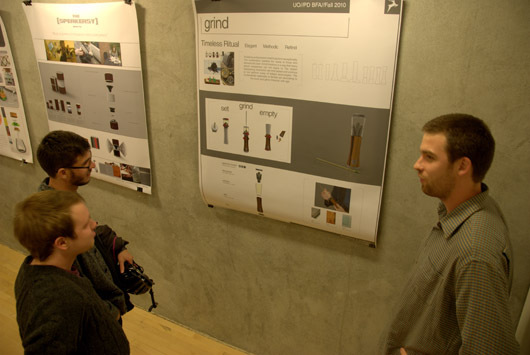 As one student remarked, his project “made use of technology but first took the simplicity of an simple object” and “adapted this to suit the needs of the individual,” in this case, a “50 year old affluent bachelor with opulent tastes and an appreciation for ‘the finer things’ named Simon” (see photo entitled “The Grind”). 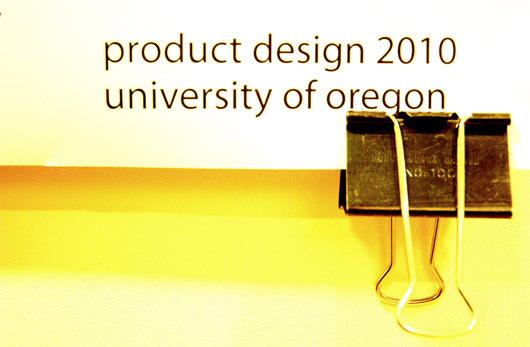 Thus, aesthetically and functionally driven projects took the concept of a useful item, such as a pencil sharpener and adapted it to be a modern, using available technology, materials such as bamboo, recycled aluminum, steel, wood, or glass and utilized a design outlook that made the product “match” the personality of the user. Sean Kelly, a Product Design program student, had the task of designing for “Malene”, an event planner, single mother and eco-conscious Parisienne. Kelly formulated that this client would want to “identify with her connections, find local food vendors and artisans in her day-to-day life and socialize with her friends by being able to share digitally with them and be able to physically and emotionally connect with people she cares about while in her own home.” Kelly’s product is a small notepassing system that allows Malene to have a pendant-sized object on her person that incorporates the technology to pass notes and exchange information with her children and friends. This “U.sb” is not an internet-based device as Kelly thinks that Malene does not want to have to have constant interaction with online sources but rather a place to dock and then upload information into a USB port on her computer. It is, essentially, a “barrier to the internet”, says Kelly, a “physical and emotional distance” from the sterlity of the internet and much more personal, accessible and friendly. In keeping with the design intended for a woman, Kelly embraced a vessel-like shape for his creation, with a “feminine, gentle curves and the use of natural materials such as bamboo and cork,” materials he thinks Malene would find appealing. Kelly plans on continuing his development of this piece, commenting that for production he would research the use of a post consumer plastic rather than the glass his original concept was modeled in. 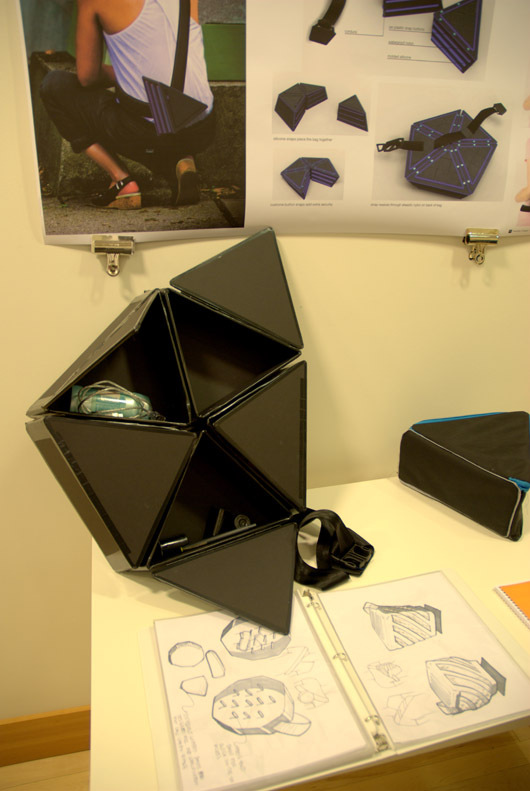 Audrey Craig developed a product for an individual “always on the go”, a music producer who travels frequently between London, Berlin and Tokyo. 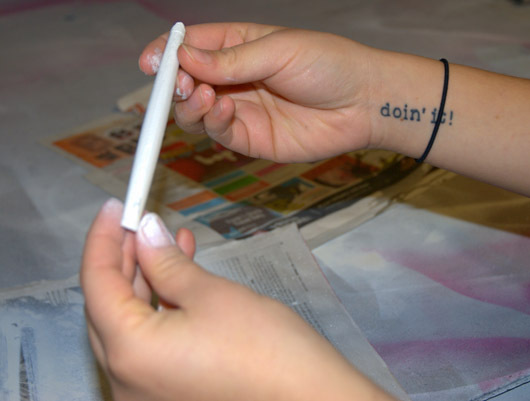 Craig saw her client as constantly needing to be connected and having the use of multiple online and electronic devices: her project, “Epod” involved developing a multiple adapter that uses motion to generate and store kinetic energy, the energy ultimately used to run this individual’s many portable electronic devices. In a very complex study of electricity and the generation and storage of energy, Craig effectively designed a system of copper coils that neatly fit within a storage cannister and operate effectively to store energy. This cannister is small enough to be worn by a person (attached to the leg or belt) and simply by walking (motion) the wearer generates kinetic energy sufficient to power electronic devices such as a laptop, an iphone, an ipod, or other small portable device useful to a professional in the music production industry. 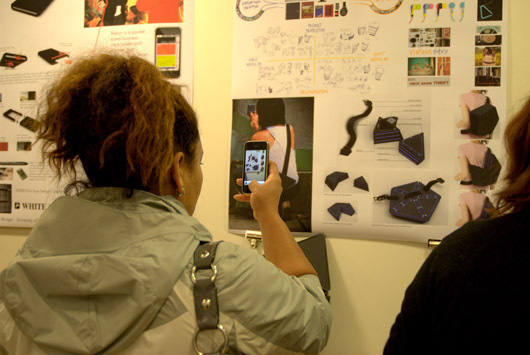 Attendee at the Open House uses her cell phone to photograph the "Dream Catcher. Many of the students entered their work in the Staples Global EcoEasy Challenge hosted by Staples office supply and in cooperation with Golisano Institute for Sustainability and the Rochester Institute of Technology. More information on this competition is available at the following location: Staples. 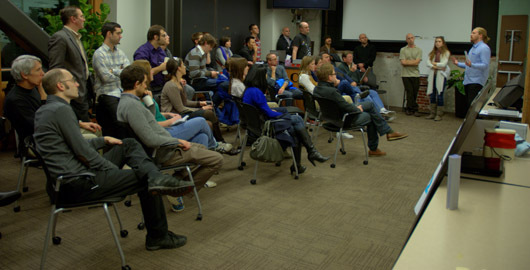 This blog entry will be updated when results of the 2011 competition are known. Ruby Sprengle makes her Plume.